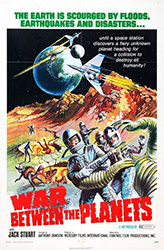 War Between the Planets is the third film in Antonio Margheriti’s loosely connected Gamma One series of science-fiction films. 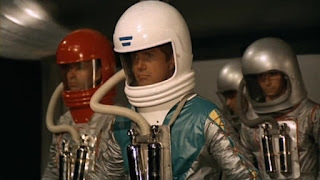 The connecting factor is mostly the economical reuse of props and models, but in general the series centers around the crew of space station Gamma One and their adventures dealing with various mad scientists and space monsters. The Earth is beset by earthquakes and storms. Scientists can’t figure out the source of these strange occurrences, but one theory is that a rogue planet has entered the solar system and is causing havoc. Commander Rod Jackson (Giacomo Rossi Stuart) is sent to Gamma One to begin the investigation. He is at odds with Lieutenant Dubrowski (Pietro Martellanza), but the two get along well enough to locate the planet. It’s a strange world though, it has a low density, it can expel gasses to navigate, and it can fire off swarms of meteors at attackers. Commander Jackson realizes that the planet is alive and that it could destroy the Earth. "Activate your Flowbee 3000, men!" War Between the Planets plays out like a talky Gorath (1962) mixed in with Battle of the Worlds (1963). The idea of a killer world coming to destroy Earth is an intriguing one, and it’s a shame the movie seems much more invested in following its two macho leads as they continually lock horns over women. It’s the route to economical film making, but it isn’t necessarily a pleasant one. It would help if either space stud, Rod Jackson or Lieutenant Dubrowski were likeable. I imagine the goal was to make them passionate alpha male adventurer types, but I was mostly looking forward to the planet eating them. Perhaps Margheriti knew that his special effects sequences weren’t going to be very successful, so he doubled down on the interpersonal drama. There are a few great model effects, including a city and Gamma One itself. Anytime an astronaut is in space things take a turn for the comical with obvious wires holding up actors who are doing their best to not flail around but failing miserably. This even extends to the model astronauts as they zip around the evil planet, looking more like they are hanging from a child’s mobile in a crib than anything else. 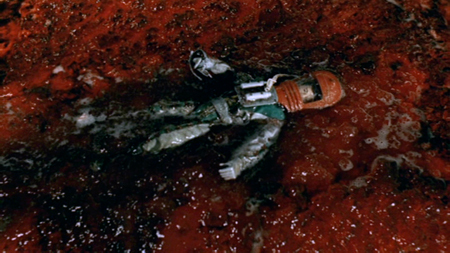 The living interior of the planet is much more successful with its blood red walls and long snaking arteries that serve as astronaut grasping tentacles. "I proclaim this place, Planet Hemorrhoid!" There is something wonderfully childlike about the whole endeavor when it finally gets to the action in the 3rd act. Maybe it’s the shiny bright colors of the models, the obvious strings, and bubbling red slime of the killer planet, but things start to feel like the fanciest toy commercial for a play set that never existed. This is the kind of movie that is perfect for Saturday mornings as you sit and eat a bowl of cereal and idly read comic books until the giant red planet on screen eats its first spaceship. Then it’s time to watch, but prior to that point, its an excruciating experience.